Cook County Board President Toni Preckwinkle has been a dedicated community leader for over two decades, providing independent and progressive leadership founded on experience, coalition building and a commitment to practical results. Though collaboration, President Preckwinkle is working with the County Board, our elected officials and county employees to implement major reforms to reshape county government into a world-class institution of which the people of Cook County can be proud. This spirit of collaboration is rooted in a common commitment to fiscal responsibility, innovative leadership, transparency and accountability and improved services. As a high school teacher in Chicago, President Preckwinkle ran a non-profit organization aimed at neighborhood improvement. She stood up to the city’s political machine and prevailed. President Preckwinkle’s tenacious grassroots campaign in 1991 delivered her to the City Council as Alderman of the 4th Ward. In her 19 years as Alderman, President Preckwinkle improved the quality of life of her constituents by providing independent, transparent and accountable leadership. She built a professional and responsive ward organization and worked tirelessly to meet the diverse needs of her constitutents. She has successfully fought for greater funding for education and affordable housing in her ward. She sponsored the Living Wage and Affordable Housing Ordinances, and was a lead plaintiff in a lawsuit to institute a more racially equitable map of Chicago’s ward boundaries. President Preckwinkle sponsored an ordinance that limits the establishment of payday loan stores and was a lead sponsor of the anti-smoking ordinance. She has not been afraid to stand-up to the status-quo, voting against parking meter privatization and standing with a small minority in opposition to the 2008 tax increases. President Preckwinkle’s independent and progressive leadership earned her the IVI-IPO Best Alderman Award in 1993, 1995, 1997, 1999, 2005 and 2008, and the 1997 and 2009 Leon Despres Awards. 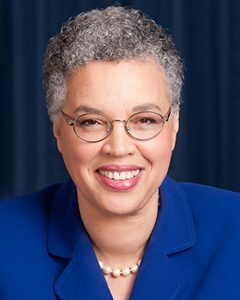 President Preckwinkle was elected Cook County Board President on November 2, 2010. She holds a Bachelor’s degree and a Master’s degree from the University of Chicago. She taught high school history for ten years before being elected to City Council. She is also a wife and a mother of two children.